Our exclusive line of flat screen monitor arms will free up valuable space by elevating your monitor off your desk. Desk-mount models easily attach to desk edge without tools, and take up virtually no space. 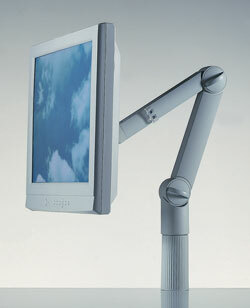 These models offer a wide range of screen positioning capability and can raise, lower, pivot, and rotate a full 360°. Spring assisted technology allows you to maneuver the screen with ease. Wall-mount models free up even more desk space. 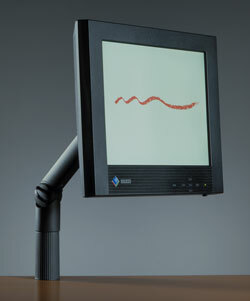 Both models provide screen pivoting capability for optimum viewing. All desk and wall-mount models meet VESA 3" x 3" and 4"x 4" standards. The 1-Link Arm has an independently adjustable spring-loaded articulating arm, and a ball joint with a swivel range of 90°. Arm rotates 360° for optimum positioning. Two models support monitors from 5-11 lbs or 11-17 lbs. Features also include integrated cable management and VESA two mounting plates. 2-Link Arm has the same features as the 1-Link Arm but the two spring-loaded arms provide infinitely adjustable positioning. Supports monitors up to 11 lbs. Wall-Mount Support saves desk space by mounting directly to the wall. Features a ball joint with a swivel range of 90°. Holds monitors up to 17 lbs. Telescoping Wall- Mount Support is a wall-mounted 7-1/2" arm that extends an additional 1 1/4" to allow full range of screen angle adjustment. Features ball joint with a swivel range of 90°. Supports monitors up to 17 lbs.